If you are already installed unzip,wget and java so skip this step. Otherwise, you can install it using the following command. # wget --no-cookies --no-check-certificate --header "Cookie: gpw_e24=http%3A%2F%2Fwww.oracle.com%2F; oraclelicense=accept-securebackup-cookie" "http://download.oracle.com/otn-pub/java/jdk/8u161-b12/2f38c3b165be4555a1fa6e98c45e0808/jdk-8u161-linux-x64.tar.gz"
you can download glassfish server from here. 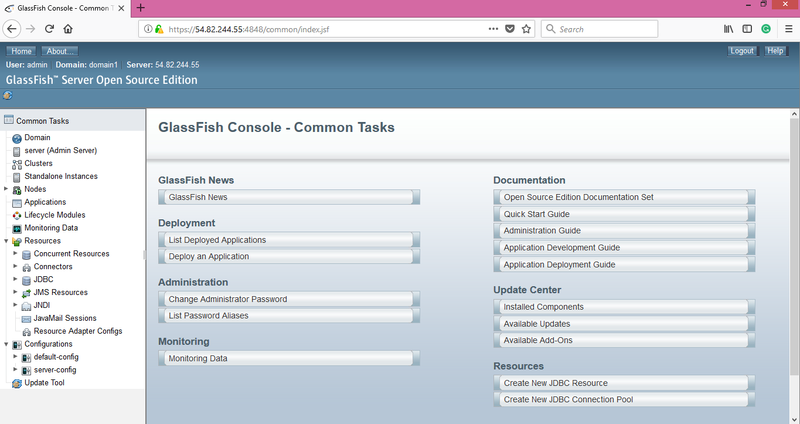 Now the glassfish server is started. Glassfish server by default runs on 4848 port. Before login, you need to change the admin password and redirect to secure port. Here it will ask for admin name, admin password, new admin password, confirm admin password. Remember glassfish default admin password is blank. Here it will ask for admin name, admin password gives this details and restarts glassfish. Now you can access URL: your_ip_address:4848 and log in with credentials. After login GlashFish server Console appears. This will give you a username of 'admin' and password 'changeit'. After changing the file you need to restart the service.